With most of the penguin exhibit construction out of the way, our exhibit fabrication team is now shifting focus to adding the details that make the exhibit feel truly immersive. 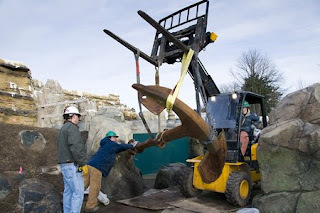 A 2-ton anchor was dropped into the exhibit space yesterday to add a visual cue that the exhibit takes you from the penguin-filled shoreline of Punta San Juan, Peru to the underwater ecosystem where penguins find their food. Here you'll also learn about the commercial overfishing of anchovies--penguins' favorite food--and how some conservationists believe changing our food habits can help save the endangered Humboldt penguin species. You see, anchovies are primarily overfished to be ground down and used as farm feed. To encourage Peruvian fisheries to harvest fewer anchovies, consumers would need to create a profitable market for anchovies beyond their current, wasteful use as feed for farms. By choosing to eat more anchovies, we can give the fisheries more money for fewer fish, leaving them with less of a need to overfish. With less competition, penguins will have better and safer access to anchovies. 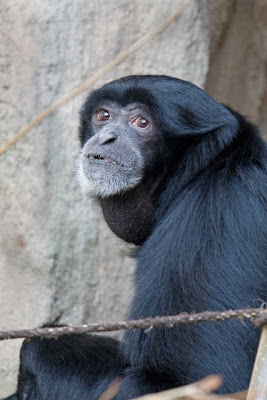 A woman recently contacted the zoo to say that her daughter, Alanna, would be turning 13 on Friday the 13th. One of the tasks given to Alanna to accomplish on her birthday was to get photos she had taken at the zoo published. Well this Friday the 13th is your lucky day, Alanna. We thought no better spot than the zoo blog to show her creative streak and no better way to wish Alanna a very happy birthday! 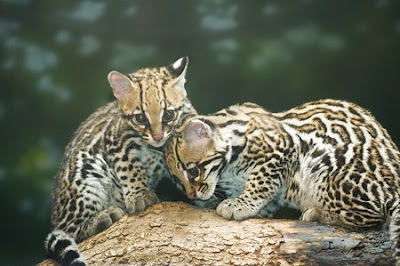 The ocelot kittens are out on public view! Want to see Novia and Corisandra climbing and jumping around for yourself? Aim to visit the Tropical Rain Forest building around 2-3 pm when they are typically at their most active. Of course, viewing hours may vary as the young cats adjust to their new surroundings. 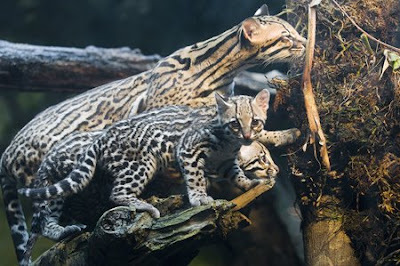 If you'll remember, the mother and kittens (pictured together above) have remained off public exhibit since birth to allow for continued nursing and bonding in a quiet environment. In preparation for the kittens’ move to the public exhibit, zookeepers have helped promote the necessary motor and exploratory skills for proper growth and development through off-exhibit climbing structures and a variety of enrichment activities. Judging from how well they move around the exhibit now, that early enrichment sure has paid off! 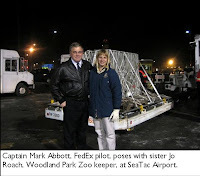 When FedEx pilot Captain Mark Abbott heard from his sister Jo Roach, a zookeeper at Woodland Park Zoo, that a special delivery was due to the zoo in December, he pulled some strings to get in on the momentous occasion: the arrival of Leonel, a 30-year-old silverback gorilla, via FedEx to Seattle (Leonel pictured left). The brother-sister team is no stranger to great apes: Jo as a keeper at WPZ for 19 years and Captain Abbott who lived with his wife in Africa for years. But for the first time, their work converged as Woodland Park Zoo made preparations to ship Leonel from his last temporary zoo location in Columbus to his new permanent home in Seattle. 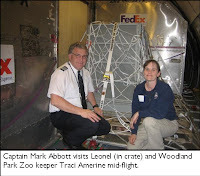 Leonel flew FedEx to Seattle in the company of a zoo vet and one of his new keepers-to-be, Traci Amerine. This very special cargo was novel for 14-year FedEx veteran Captain Abbott—he had flown with horses before, but never an animal quite like Leo. Though he could not see or hear Leonel while in flight, according to Captain Abbott, he sure could smell him! Partway through the flight, Captain Abbott did have a chance to take a break and meet Leonel under the supervision of Leo’s caretakers. “He was really calm,” said Abbott, who had the opportunity to feed Leo some treats and hear the gorilla’s vocalizations. A smooth flight, the real challenge came when the plane landed at SeaTac Airport on one of the year’s busiest flight days, and in one of the worst storms of the winter. 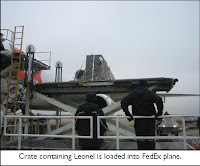 Faced with icy conditions, FedEx, SeaTac and zoo staffers worked extra hard to safely unload Leonel’s crate and transfer it to a truck bound for the zoo. It was here that Mark passed along the duty of Leonel’s care to his sister, Jo, who works as the quarantine keeper at the zoo’s animal hospital where Leonel is temporarily residing. Leonel is slowly adjusting to his new home at the zoo. For now, he is staying in the quarantine space under Jo’s care. But once his vets give him the OK, he’ll move to a behind-the-scenes area at the gorilla exhibit where he’ll slowly be introduced to some of the females that will be his group mates. “Leo is getting comfortable,” according to Jo, who says he likes to call out to his keepers to keep track of their locations, a sign that he has the instincts to be a group leader. The gorilla keepers have been visiting Leonel, getting one-on-one time with him and helping him adjust to the new cast of caretakers in his life. We hope to provide updates as Leonel settles into his home and the dynamics of our gorilla groups evolve to adjust to the presence of a new silverback. Photos provided by Mark Abbott & Traci Amerine. 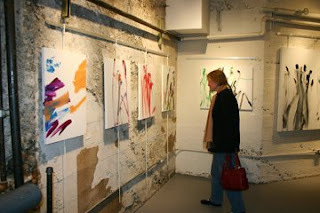 Thank you to all who came out for the opening of Seattle’s first non-human art show! 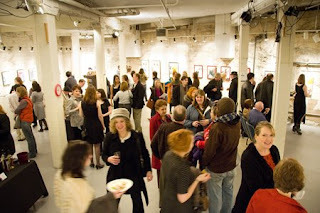 Hundreds of animal- and art-lovers alike funneled in throughout the evening, taking in the work, chatting with zookeepers about the animal artists, and enjoying the reception provided by PengWine. 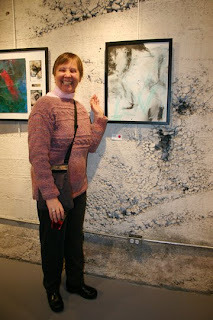 Here's a proud new owner of artwork by orangutan Towan, standing next to her purchase! Many of the pieces sold quickly—but don’t worry, all of the works will continue to show through March 5 at Art/Not Terminal Gallery in Seattle. It’s FREE to visit, so please stop by. Photos: Ryan Hawk (top), Ric Brewer. 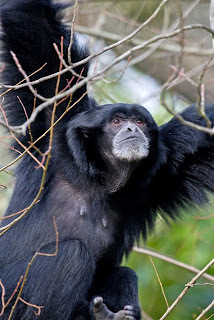 Looks like Woodland Park Zoo's new female siamang has taken to the trees after her recent introduction to the outdoor exhibit. Volunteer photographer Dennis Dow, who snapped these shots, said "She seemed very comfortable as well as athletic as she swung through the branches." 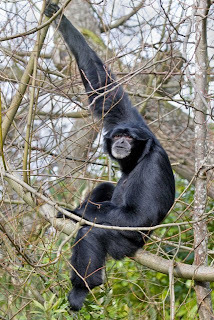 You can find the siamangs in the Trail of Vines exhibit in Woodland Park Zoo's Tropical Asia biome. Yesterday, Asian elephant Chai put some finishing touches on a painting for the Saturday premiere of Seattle's first ever animal art show. 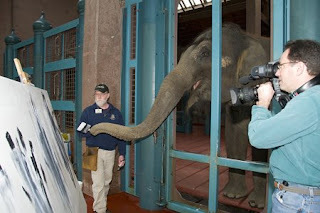 KING 5 Evening Magazine filmed as Chai used her trunk to apply a paintbrush to the canvas, with direction and reward from her keepers. Reward comes in the form of tasty apples and carrots, of course! The final piece, measuring in at a dramatic 4'x6' and titled "Tres, Trio, Drei," is a group effort by Woodland Park Zoo's three elephants. 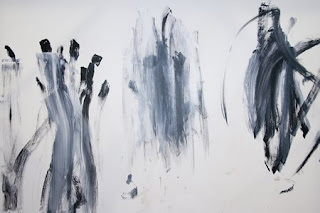 The left most portion was painted by African elephant Watoto, the middle by Asian elephant Bamboo, and the right by Chai. Both Bamboo and Chai also "signed" their portions with a trunk mark. "Tres, Trio, Drei" and more than 20 other paintings will be available for purchase at Art/Not Terminal Gallery through March 5. We've filled the penguin pool for the first and last time! Why is that important? 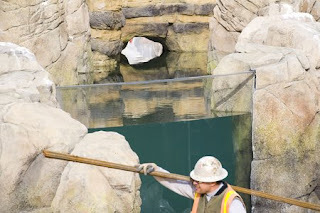 Well, to help "green" the exhibit, instead of traditional fill and dump practices, we will fill the penguin pool only once. Then, we will use the earth’s natural systems to ensure a pristine water environment for these endangered birds while preventing stormwater runoff from entering our lakes, thus contributing to the health of Puget Sound. With the green technologies, the exhibit will save approximately 3,000,000 gallons of water and 75,000,000 BTUs of energy each year! That’s the equivalent of saving 24 million pints of drinking water, and heating five, new two-bedroom townhouses each year. How are we saving so much water and energy? The exhibit will filter stormwater on site in two ways. First, it will collect rainwater from the roof and use it to replace pool water lost naturally through evaporation. All rainwater that falls onto the paths will filter back into the ground to recharge the earth. Second, “dirty” but nutrient-rich water from the penguin pool will trickle through a “constructed wetland” modeled on a natural filtration ecosystem. Here, plant roots and microbes will naturally absorb these nutrients, returning purified water to the penguin pool. No water will enter the sewer system. The earth's own geothermal capacity will heat and cool the penguin pool water. 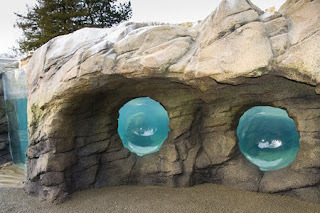 Humboldt penguins’ ideal water temperature is 50-60° F, and the earth’s temperature 100 feet below the exhibit is 55° F. Deep tubes will use the earth’s thermal reserves to temper the penguin pool water appropriately, cooling it in summer and heating it in winter. These innovations are made possible in part by grants from Seattle Public Utilities and Seattle City Light. 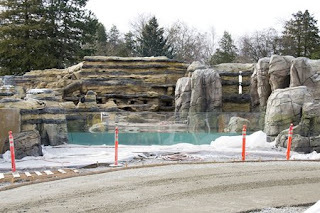 Don't forget, the penguin exhibit opens to the public May 2, 2009! 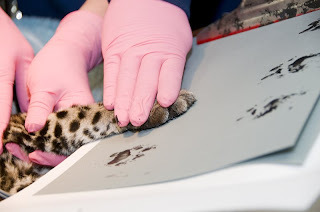 Everyone's favorite ocelot kittens received their 18-week physical examination from Woodland Park Zoo's Animal Health staff last week. The female twins--named Novia and Corisandra--were weighed and measured, had their blood drawn and received their final set of vaccinations as kittens. All is well and the kittens will soon begin their introduction to the ocelot exhibit. Ocelot footprints were also taken during the exam for sale at the upcoming animal art show, opening this Saturday, 2/7.